My latest FO is made of 23 parts and has been a long time coming. 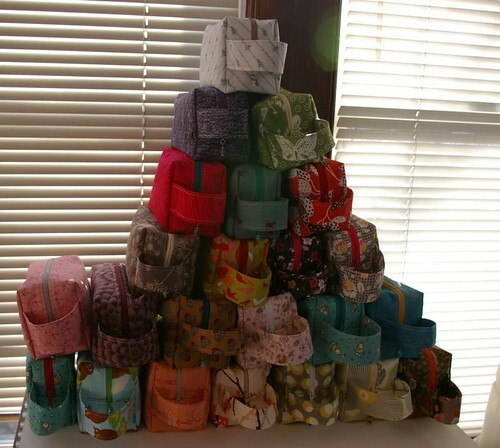 At the beginning of January I started a batch of box bags and they’re finally done! What you see there is my leaning tower of box bags. 20 of these bags are from this batch, 3 from the last batch. There are 3 that are not on the picture because they’re gone to their new homes already. There are 11 large bags and 12 smaller bags. I have taken individual pictures of some of them already, but the others will come later. These bags are for now available for purchase through the blog but will be made available at yarn4socks after that. If something strikes your eye in the mean time, let me know! Oooohh…I love them all. Very nice. I’m in love with the bird one with the brown and orange. How much are you charging? What a great stack! I like the retro-y one with black/yellow/red pattern on the right side of the pyramid. Great scarf too, makes me want to learn to weave! Wow! 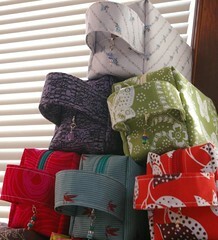 You have been busy (and so has your sewing machine! I can personally say that Valerie’s bags are the best, they are roomy enough to have 2 socks in progress along with the yarn in them (I have one large and another that I think its a small). Her workmanship is stellar, she makes a srsly mean box bag! Her bags are the only one’s that I have two of. 🙂 I really wish I could justify getting a third one! These are really cute. I would love to know more about pricing and how to order! You know how, if you keep thinking of something days after you saw it, it isn’t just a passing whim/shopping lust? Yeah, for me, that’s your bags! How much is a small bag?